My little goodbye for the final issue of the late, great Nintendo Gamer/NGamer/NGC/N64 was shortened a bit for space reasons. Which means my amazing joke about the R-Type robot on issue 7’s cover was lost to the ages. Until now! Here, I give you the uncut version, and get a little bit sad again about the closure of the mag. And I meant “space lips”, not “space moustache”. Tsk. Cripes, I’d forgotten that the cover logo once featured the robot from R-Type, of all things. That’s the beauty of being the Editor, readers — you can do what you want! I miss it, you know. Helping launch NGamer and steering it through its first couple of years was an absolute honour. Scary, too — how was I going to live up to the legacy of Super Play, N64 and NGC? The answer: cheat. I had the best team and the best readers in the world — so I could basically just sit back and watch 100 pages of peerless magazine magic materialize in front of my eyes every month. What I loved most were the tiny things that took a preposterous amount of work, like Chrissy wearily photographing all 97 Nintendogs costumes or Matthew trawling through blurry Mario Galaxy preview video for a scoop (and only finding a “space moustache”). 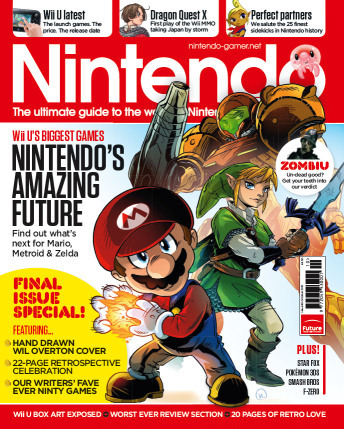 That was the special stuff, because it made the mag feel as full of secrets, surprises, love and care as a Nintendo game. So I’m sad as anything to see it all end. But Nintendo Gamer’s spirit lives on, readers — in your hearts and in your souls! And on your bookshelf if you keep your old copies of the mag, natch. I had such a nostalgia rush when reading your farewell. Even today my gaming life still doesn’t feel quite the same without the NGamer lineage of magazines, which made celebrating Nintendo’s culture and heritage the most fun thing in the world. Even when that might have been through uncontrollable laughing by way of a fake Stars Catalogue, run by Hiroshi Yamauchi, or reading Kittsy’s analogy for Excite Truck’s soundtrack. I could write tomes of examples where the NGamer lineage raised a smile to my face. Thanks for everything, Nintendo Gamer, and thank you, Greener!